After sketching the Wood Storks, Rob and I drove over to the golf club on Spring Island. To one side of the club house are tabby ruins from the original plantation home. I headed for the shade of some Live Oak trees that stand on the edge of the marsh in front of the ruins and did this quick sketch of the view. Post using BlogPress from my iPod. You brave girl, going out in this heat and creating something beautiful, while I sit on the sofa reading and trying to stay cool. Lovely view with that white-hot sky. What a beautiful sketch Pam! 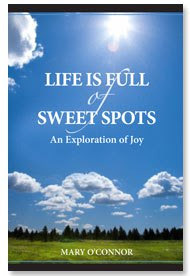 It beautifully portrays part of the marsh! Oh I can almost feel that hazy heat. Well done! I can FEEL the steamy humidity in this painting. That big sky has so much impact! Stay cool for a whille now. Thanks, Elizabeth! Bet you know 'steamy' days well, too! Clouds yesterday with rain. Felt good! Love your scene here. It looks so peaceful. It's hard to keep up as technology keeps us outpaced really but we have to try. Congrats on figuring out how to blog from your Ipod! Thanks, Timree! Now I have to do it every now and then when I'm home so I don't forget how!! 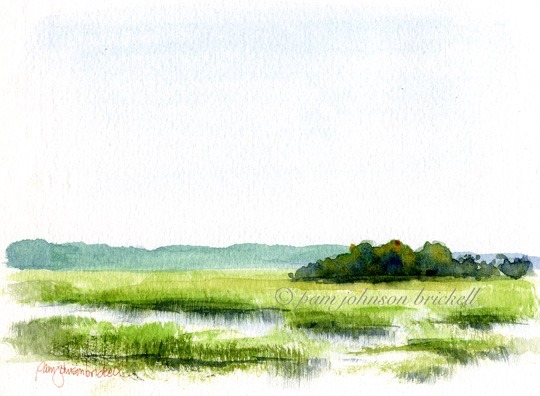 I love the simplicity of this sketch while it holds the feeling and looks of the marsh land in S.C.